Wouldn’t it be great to get rewarded for saving money? With the Seashells app, you can do just that, in a fun way that requires zero effort. The app is brand new, having just launched in January, and I’m excited to tell you all about it! 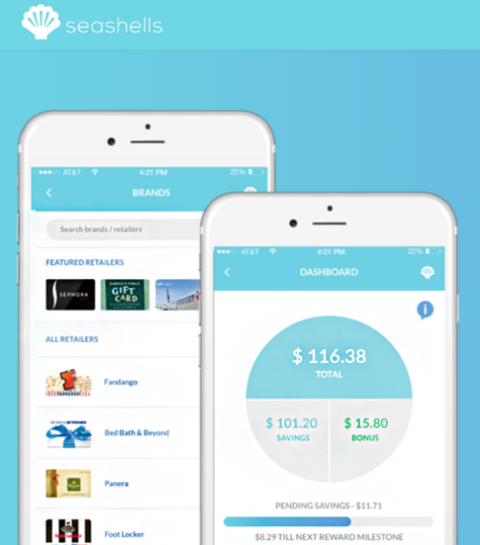 Seashells is an app that helps you set aside money with every purchase you make. It works by automatically rounding up all your transactions to the next whole dollar. So, say you buy a coffee for $3.20. Seashells would round up the transaction to $4, and save 80¢ for you. But it’s more than just round-up savings. With Seashells you automatically earn an additional 15% on top of whatever you save. I’m talking about free money here! Seashells claims the average user saves about $40 a month through round ups, and earns an additional $6. That's $46 in total rewards every month! Your Seashells savings and rewards can then be redeemed in over 180 ways including stores like Sephora, Kmart, Sears, Home Depot, CVS, Baby Gap, and Bed Bath Beyond among others; travel options like American Airlines, Delta, and Hotels.com; and entertainment options like Groupon, Fandango, Dominos, and TGIFridays. No matter how you choose to redeem, Seashells is a great way to set aside money for a future purchase that you were probably going to have to make anyways. And in addition, you get free money towards that purchase! It’s a really fun and easy way to save, and I highly recommend checking it out! Download it now at the Apple Store and Google Play! Wow, never heard of this before. Going to go look at it now. I love "FREE" money! Lisa thanks for sharing I am always looking for deal apps. I will need ro make room on my storage for this one. Seems like a cool app so I will download it tonight. Thanks for sharing! Going to check this out now! You're welcome! I'm sure you'll want it too! Ooh this app sounds seriously cool! I need this! It's a great way to save money, isn't it? What a savings!! Will have to check it out! I love the "round up" function! What a cool way to save easily! Going to check their app today. I know you'll love it as much as I do! Very cool! It's a very easy way to save, I'll head over to the app store and log in to check it out. Yep! We're shopping anyway, right? May as well save money when we do! Just curious, why did the designers call is Seashells? Was it in reference to shells being used as money? Interesting! Great question! I don't know the answer to that. Anyway you increase savings is a winner for me! I actually saw this briefly come across my twitter feed at one point. I thought about it but got side tracked and never looked into it. Might be a great way to put money aside for Christmas and vacation! This looks interesting. Downloaded it and will try it out. TY For sharing. I had not heard of this. Thank you for letting me know. The family will enjoy!